Create a miniature world from your imagination! These step-by-step directions explain the basics of making a terrarium, but the sky is the limit when choosing plant combinations, decorations, and what story you want to tell through your terrarium. 1. Decide whether you want to make a closed or open terrarium. A closed terrarium, a container with a lid, features ferns, moss and other houseplants that require a humid, moist environment. An open terrarium, container without a lid, features cacti and succulent plants that prefer low humidity and dry conditions. 2. Carefully line the bottom of the terrarium with one or two inches of pebbles. Leave a small well in the middle for the charcoal. 3. Place the charcoal in the central well of the pebbles. Pro Tip: Charcoal isn't absolutely necessary, but it limits mold and odor. 4. Cut a piece of small-mesh, window screen that reaches edge-to-edge of the terrarium. An easy method is to trace around the bottom of the container and cut out the shape. Pro Tip: The screen layer prevents potting soil from sifting down into the pebbles over time. It is not necessary but creates a tidy separation if the pebbles are being used as a color contrast to the soil. 5. Next add two or three inches of potting soil, depending on the depth of your container. Step back and observe if the proportions are right (about 1/4 of the container should be filled). Use a soil mix that is appropriate for your plants. Houseplants - Use coir potting mix or potting soil. Succulents/Cacti - Use cactus & succulent soil mix (grittier ingredients make for better drainage). 6. Level the surface as needed. If you'll view the terrarium from one angle, then you could slope the soil surface and make the backside higher than the front. If the terrarium will be viewable from multiple sides, then keep the soil surface level. 7. Take your chosen plants, starting with the largest, out of their pots and gently remove as much soil from their roots as possible. Place each plant in the terrarium and sprinkle some soil to cover their roots. Pro Tip: Choose plants that have similar requirements for light, grow slowly, and remain small. Look for a mix of growing habits, for example one upright plant and a second creeping plant. Also think about leaf textures, such as combining a ferny-leaved, green plant with a broad-leaved, colorful plant. 8. If planting a closed terrarium, now is the time to arrange the moss on the soil surface. 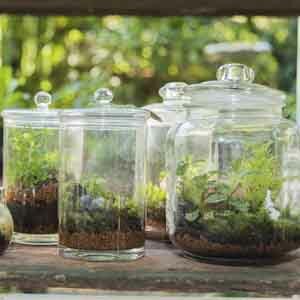 Preserved moss is not living, but provides an appealing, finished look to a terrarium. 9. Now you can get creative and decorate your terrarium. You can use miniature glass objects, small plastic figurines, battery-operated lights, wire forms or anything else that is moisture-proof. 10. Last, water your plants and set the terrarium in a place where it will receive just the right amount of sunlight. If you have a closed-style terrarium, mist or lightly water the plants whenever the top inch of soil is dry to the touch. Set the terrarium in a well-lit location, away from direct sunlight. Every so often, trim back the plants to maintain their small size and remove dead leaves. If you have an open terrarium, water the plants whenever the top inch of soil is dry to the touch. Set the terrarium in a bright sunny location. Design your dream vacation spot. Go micro-miniature and use a tiny container. Air plants are another way to enjoy plants in a small space. Find out how to grow air plants!